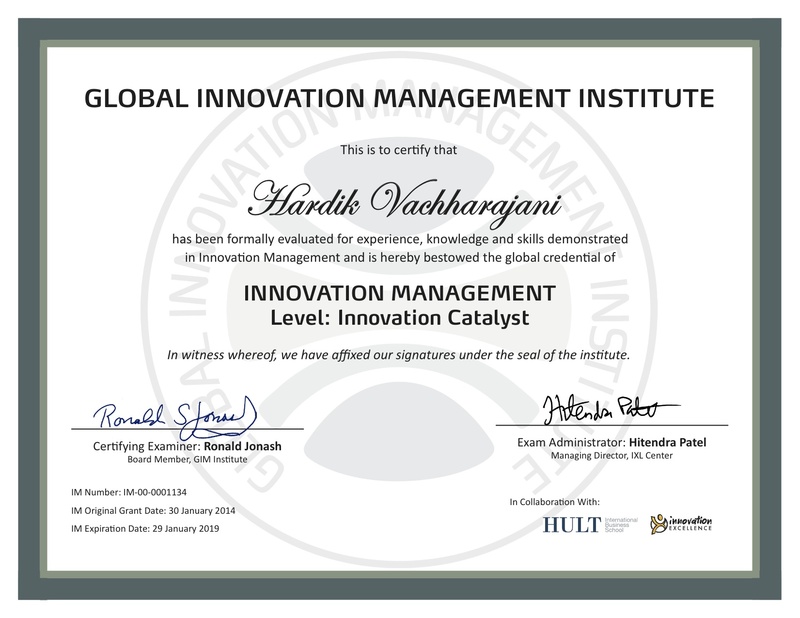 On 30/January/2014, Global Innovation Management Institute (GIMI) bestowed upon Hardik Vachhrajani global credential of ‘Innovation Management Catalyst’. Hardik Vachhrajani cleared the certification exam by securing 84% marks. The certificate is offered by GIMI in collaboration with HULT International Business School and Innovation Excellence. GIMI is created by a group of innovation executives, academics and consultants from around the world and its mission is to help individuals, companies and regions develop world class innovation management capabilities through global standards, testing protocols and certification. Certificate evaluates experience, knowledge and skills demonstrated in Innovation Management area. The certificate will remain valid till 29/January/2019.